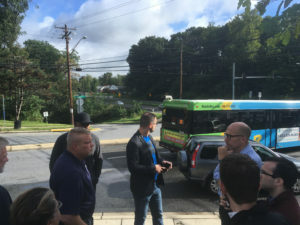 This morning Councilmember Hucker joined community leaders, the Montgomery County Department of Transportation (MCDOT), the Maryland State Highway Administration (SHA), and Prince George’s County Councilmember Deni Taveras at the intersection of New Hampshire Avenue and Northampton Drive in Silver Spring to discuss pedestrian safety improvements. Sitting on the border of Montgomery County and Prince George’s County, this stretch of New Hampshire Avenue has been long neglected by both counties in part due to uncertainty about the location of the county line itself. I’m working to change that. A constituent of Councilmember Hucker from the Oakview neighborhood, Scott Baumgartner, reached out to the office recently with various pedestrian safety concerns at and near the intersection. The intersection of New Hampshire and Northampton is adjacent to two large apartment complexes and is served by some of the busiest bus routes in the region, including Ride On routes 20 and 22, along with Metrobus route K6 and MetroExtra route K9. Despite the high transit ridership and pedestrian activity of the area, the surrounding pedestrian facilities are sorely lacking. A new marked crosswalk with accessible curb ramps where Northampton Dr meets New Hampshire Ave.
A new short stretch of sidewalk along an existing desire path to connect Avenel Rd with the bus stop at Northampton. Repainting existing crosswalk markings across New Hampshire Ave to make them more visible. Repairs to the existing sidewalks on New Hampshire Ave and creation of accessible ramps at existing curb cuts to meet accessibility standards. Trimming and removal of overgrown vegetation infringing on the sidewalk. Repairing the mural along New Hampshire Ave at Piney Branch Rd. Councilmember Hucker was encouraged to hear MCDOT’s commitment to add a marked crosswalk across Northampton and to add accessible ramps on either side of the intersection. The Councilmember is coordinating with MCDOT and SHA to address the various other issues along New Hampshire Avenue and he is hopeful that many of these common sense fixes will soon be made.